The HTC Rezound (formerly the Vigor) has been on our radar for what seems like forever now, but we’re here in New York City for HTC’s big event, and they have just officially pulled back the curtains on their next Gingerbread-powered smartphone. Fear not though, Ice Cream Sandwich fans: the Rezound will ship ready for Ice Cream Sandwich, and HTC and Verizon are aiming to push it to the Rezound early next year. One of the first things you notice about the Rezound that it bucks the recent trend of super-slim smartphones. It’s not terribly thick, but it easily makes devices like the Droid Razr and the Galaxy Nexus look downright skeletal in comparison. Fortunately, the Rezound’s edges taper pretty dramatically, so it feels much less bulky than it looks. It takes more than few design cues from the Droid Incredible family too, right down to the red accents and the translucent red body under the battery cover. To make up for the heftier body, HTC saw fit to fill the Rezound to the brim with some impressive innards. 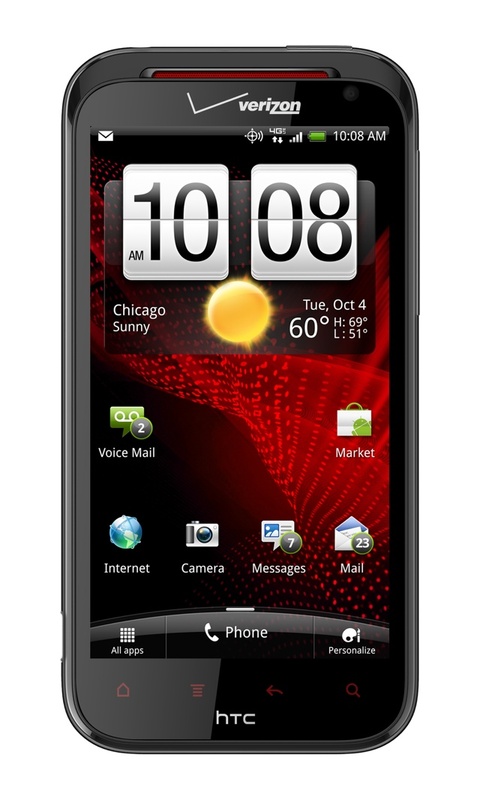 The Rezound is powered by a 1.5GHz dual-core processor and 1GB of RAM, which should be plenty for power users to enjoy. It comes with 16GB of internal storage, and the truly media hungry can take solace in the fact that it can also comes with a preloaded 16GB microSD card. As expected, the Rezound also sports a sizable (but not overly so) 4.3-inch 720p display. Just above the screen is a 2-megapixel front-facing camera, and around the back (just above the funky textured finish) there sits an 8-megapixel camera with an f/2.2 lens and a dual LED flash. HTC has tried to address some of the flaky camera issues that have appeared in early HTC devices, and added new functionality like panorama support and action burst modes. The camera is also capable of shooting video in 1080p, so mobile cinematographers should have a little bit of fun with it. Like the Thunderbolt before it, the Rezound is a Verizon LTE device, so people lucky enough to live within Verizon’s 4G coverage area should be able to enjoy some pretty snappy network performance. Fortunately, after having seen how lackluster their first LTE phone’s battery was, HTC has outfitted the Rezound with a 1,620 mAh battery for a little extra longevity. Since we’re talking about HTC here, the Rezound also features the latest version of the Sense UI over Android 2.3. We’ve seen it before on devices like the Sensation and the Rhyme, and while it adds a pretty layer of paint to the UI, ardent Android fans may still swap it out in favor of a more basic approach. If you happened to miss the Beats logo on the device’s backside, the Rezound is the first HTC device in the U.S. to feature Beats Audio. 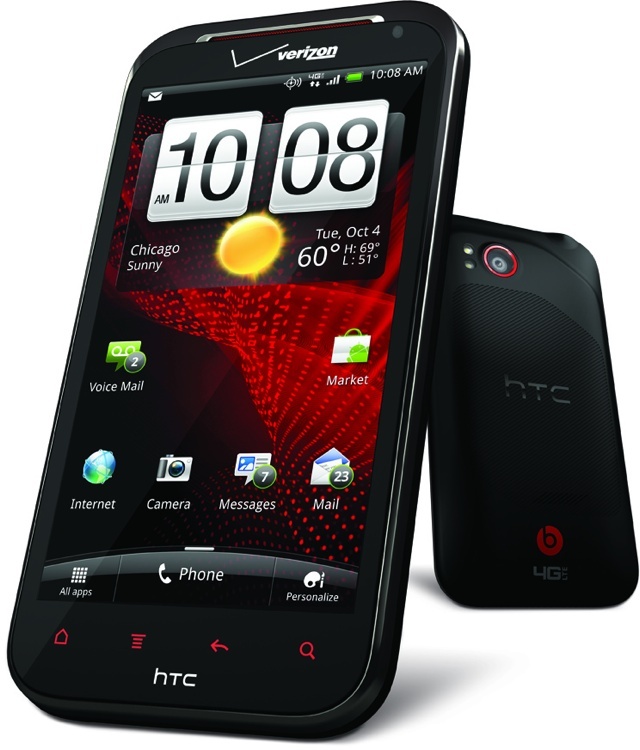 HTC’s Beats Audio functionality consists of two major components: a pair of included Beats earbuds, and a special audio profile on the phone. 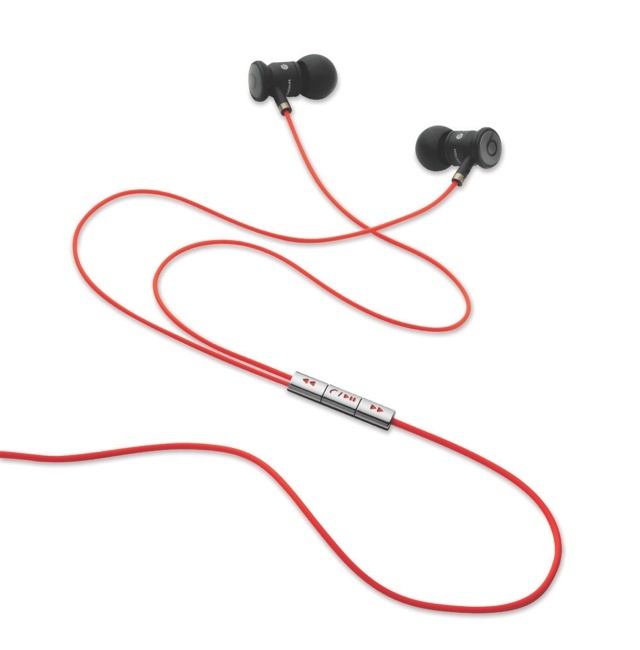 Once the headphones are plugged in, the Beats audio profile automatically kicks in, and plays with the sound output to give it some extra oomph over the pack-in cans. All things considered, HTC may have a holiday winner here. It’s not the slimmest, sleekest device you’ll ever see, but it packs plenty of horsepower and enough nifty frills that it will probably top many a geek’s wishlist. 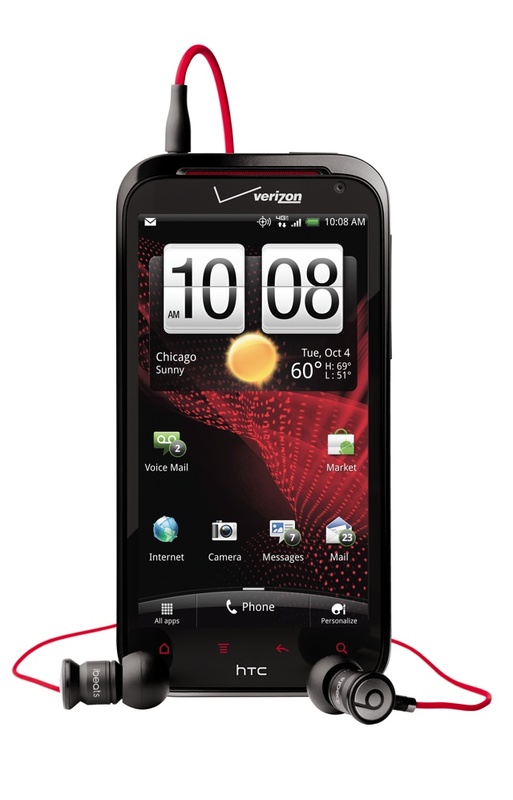 You’ll be able to pick up a Rezound from Verizon Wireless or Best Buy on November 14, with a $299 pricetag.